Our friendly and caring dental practice is here to serve you with a wide range of dental services ranging from routine cleaning to dentures. It is easy to schedule an appointment with our courteous staff members that fits into your schedule. Our online forms make registering easy and hassle free. Delivering excellent dental care as a team, in a progressive, prompt, and pleasing manner. Ryan Andris is a dental professional dedicated to excellence in general dentistry, crowns, fixed bridges, veneers, implant crowns, bonding, mouth guards, sleep apnea appliances, routine cleanings, sealants, fluoride, whitening, dentures, fillings, and oral cancer exams at our office, located in Morton IL. We serve patients from Pekin, Peoria, East Peoria, Tremont, Mackinaw, and other central IL communities. Dr. Andris grew up in Normal, Illinois, the youngest of three brothers. He attended Illinois State University, where he graduated with a Bachelors of Science in Biology and a minor in Chemistry. 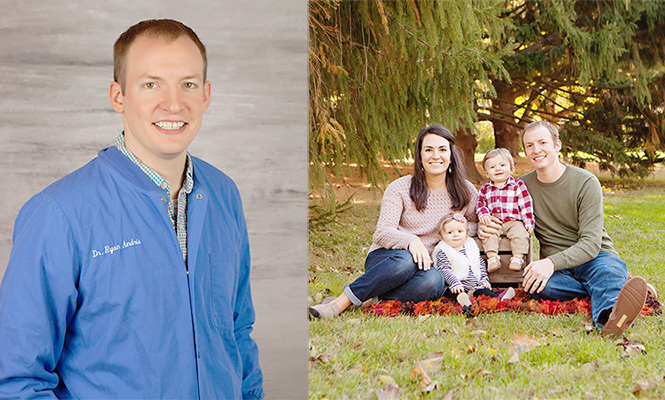 Dr. Andris is a graduate of Southern Illinois University - School of Dental Medicine where he earned his Doctor of Dental Medicine degree (D.M.D.). Dr. Andris is married to his wonderful wife, Amanda, and they have 2 children, Landon and Leighton. "The entire staff from top to bottom are courteous and professional. They make you feel welcome and comfortable from check-in to check-out."